Snowpiercer is a bullet train. The film, like its titular locomotive, races along at breakneck speed. It blitzes through its two hours and bursts through the earthly obstacles in its path. Joon-ho Bong packs a striking brutality into his English-language debut. The result is a unique and darkly compelling piece of speculative filmmaking. Crackling radio clips introduce the audience to Bong’s world. The inevitability of climate change has inspired an environmental experiment that sends the world into a new ice age. We flash forward seventeen years as a black screen gives way to a shot of a massive train racing through the snowy night. 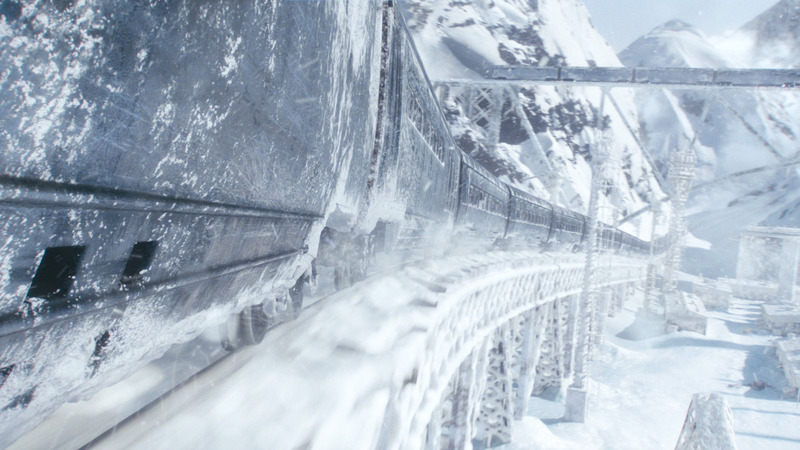 This is the Snowpiercer, an engineering marvel that now houses all the remaining life on earth. Bong pulls no punches in his vision of the near future. Classism takes the fore, embodied and organized by the cars of the train. The director first seats us in the caboose, where the poor struggle for breathing room. Wealthy passengers live in florid decadence in the front. On the Snowpiercer, everyone is kept firmly in place, the doors between cars serving as literal socioeconomic barriers. Armed guards beat anyone who dare attempts to move beyond their car. Railroad aristocrats periodically steal children from the back for a particularly appalling purpose. They gorge themselves on fine cuisine while the poor are fed slimy protein blocks made from ground insects. Towards the front, a drugged out Diskothek serves as an explicit display of the disgusting decadence. This social divide is embodied in Bong’s use of color. A grimy palette of black, dim brown and grey establishes the tail inhabitants’ suffering even before some mild exposition confirms it. And when a member of the upper crust steps into the back, the resulting splash of bright fabric further emphasizes the segregation. Later, Bong frames an especially violent sequence in an sauna in a yellow haze. We see careless bathers wrapped in towels as guards attempt to bury the rebels in bullets. Witnessing these echelons steeped in blood is powerfully disturbing. 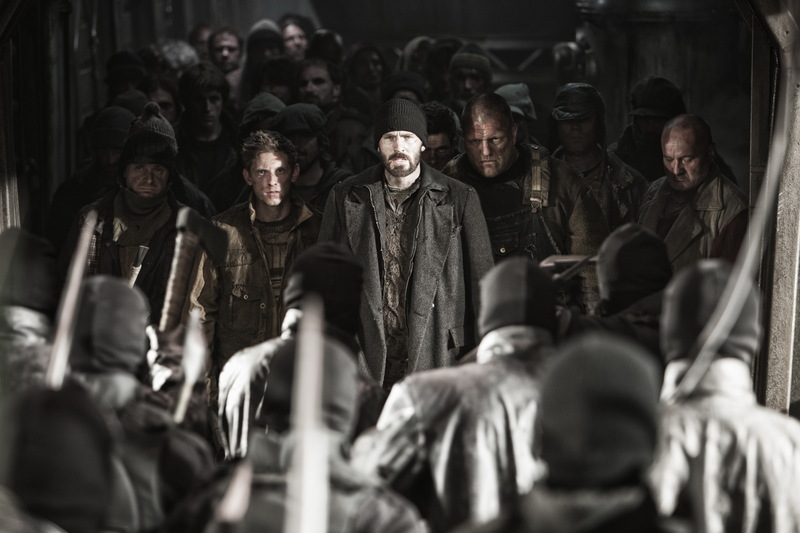 The propaganda surrounding the train and its factions adds to Snowpiercer’s chilling immersion. Rapid tone shifts are wonderfully jarring. At one point, a pregnant teacher performs a saccharine Wilford-praising song to her students from atop a rotating organ platform. Bong seamlessly transitions that overblown visual sweetness into something far more sinister, and the effect is devastating. Bong hides Chris Evans’ impressive Captain America physique under cleverly placed clothing and uses makeup to hollow his cheeks. Tilda Swinton’s twitchy Minister Mason spouts cultish praise for Wilford, the train’s mysterious creator and the keeper of the engine. The characters extend beyond the cast; even the engine itself is described as a type of deity by the wealthier passengers. Unlike the train, Snowpiercer is not a film powered by a perpetual motion engine. Bong presents a collection of bold ideas and an exciting aesthetic, but it doesn’t fully coalesce into a whole. The director seems to be missing that one masterstroke that cements his artistic thesis. Dystopian genre tropes become more noticeable in the film’s final act. There’s a hint of Brave New World as the philosophy of social stratification is once again explained in an endgame sequence, and the culmination of the “fight to the front” rebellion can’t help but feel like trite déjà vu. Chris Evans remains committed even through the film’s rustier tracks. The star delivers a performance with enough emotional depth to save the slightly heavy-handed finale. When Curtis breaks, I broke with him. Bong uses our last moments with the character to bolt down the bizarre, painful truths of this world. It works. 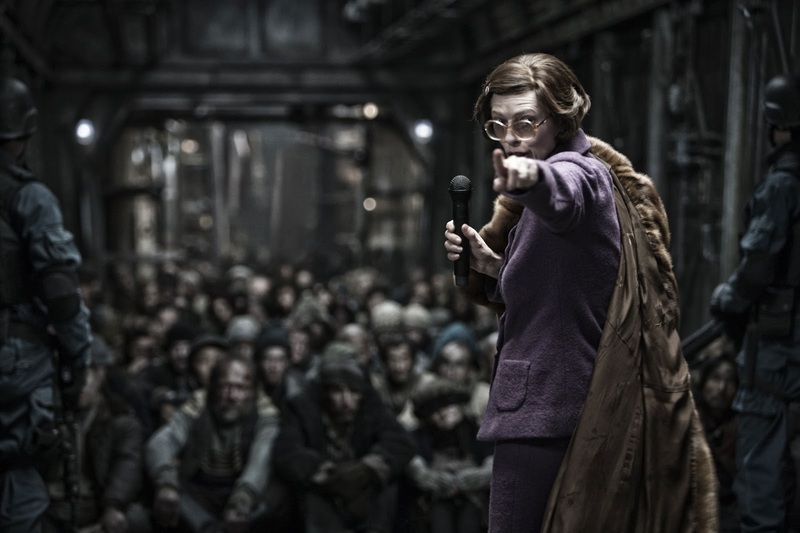 Snowpiercer eventually runs off the rails, but the film leaves a mark. This article was published in its original form in The Massachusetts Daily Collegian on September 4, 2014.